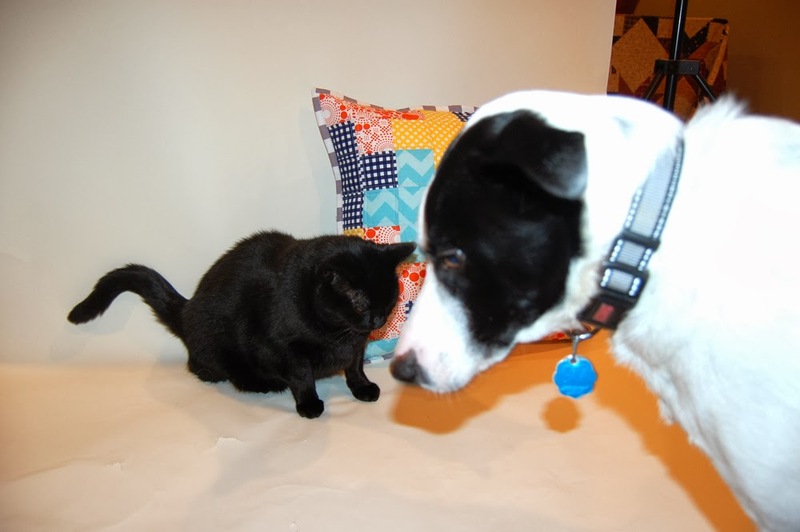 If you're coming here from my friend Cheryl's blog, welcome! Cheryl is a friend of mine from the Baltimore Modern Quilt guild. She's a super talented long arm quilter and overall fun gal! We're cooking up plans for a fun collaboration in 2015! Stay tuned for that. A little about me: I've been quilting for the past 25 years, on and off. Mostly "on" lately. I'm from Central New York (go 'Cuse!) and have lived in Houston (sadly, before I was a quilter), then Los Angeles, then Virginia Beach and now Baltimore for the past 4 years. 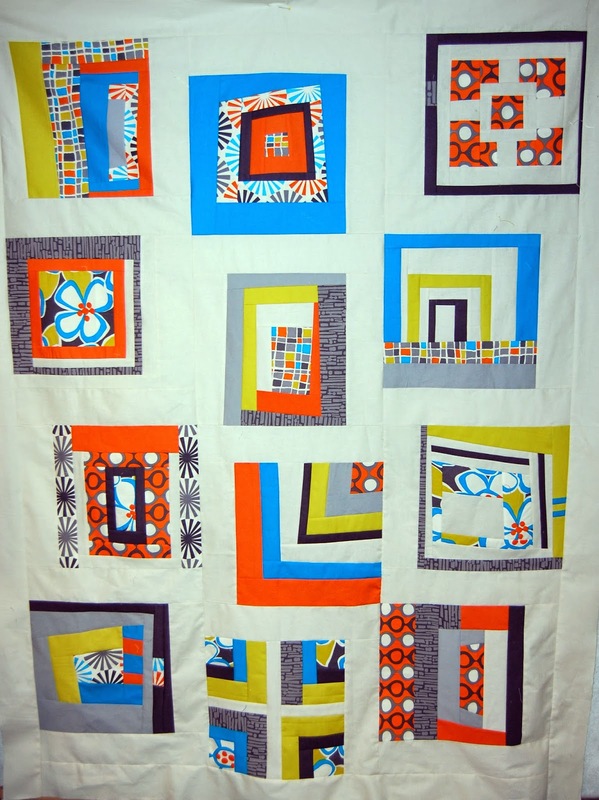 I founded the Baltimore Modern Quilt Guild 4 years ago. In the past year, I've started teaching and lecturing both locally and regionally and I love it! I hope to do more of it in 2015. When I'm not quilting, I love to read, write, cook and occasionally kayak. But really, it's mostly about quilting around here! My husband Harvey and I have two children, Kyle and Katie, both in college, plus two cats and a rescue dog, Chase. Ty and Chase getting in on a photo shoot! I'm just finishing up some sample quilts for new classes in 2015. After that, I'm writing a new book with my friend John. All the projects need to be finished by the end of December, so I'm sure that will keep me occupied! Well, if I could figure out my genre, I'd tell you. I think my work is a blend of Traditional and Modern Quilting. I lean towards simple shapes, sometimes over-sized. I like to start with traditional blocks (I'm addicted to old quilting books) and give them an updated style. 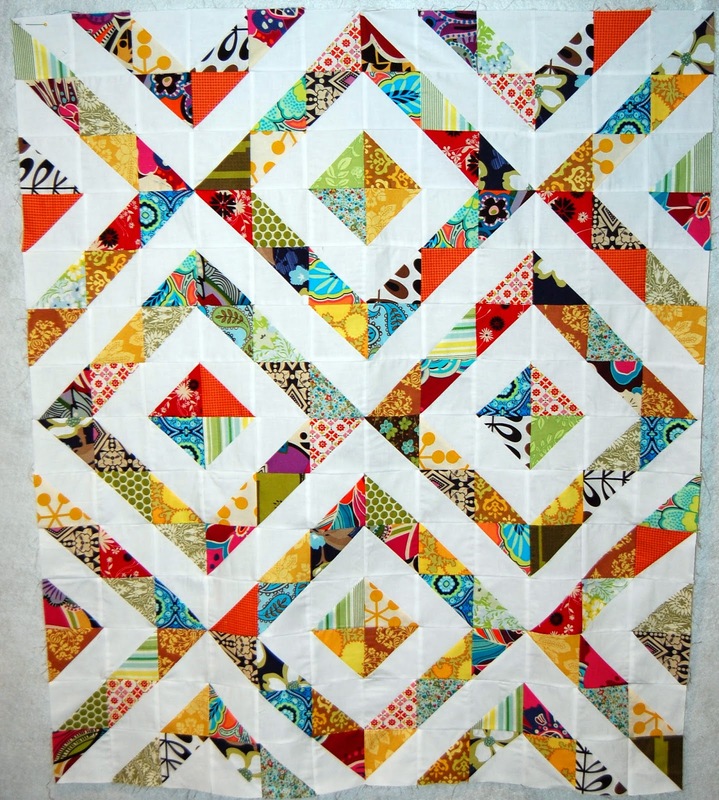 One thing I'm trying to do is edit my quilts, leaving some elements out, so I can put more quilting in. I need to make something every day. I get antsy if I don't. I work a full time job, so in order to get some sewing time in, I'll get up at 5:30. Yup, you heard me. 5:30 AM just to sew! I get a nice big cup of coffee, go down to my studio (in the finished basement) and sew for a bit. Sometimes just a few minutes. Sometimes an hour. I usually have a project set up in advance, so it's just simple straight lines. No cutting, no involved piecing. Just shoving fabric under the needle. It's my way to ease into the day. If I'm designing a quilt, I'll typically start with a block or a shape for inspiration (again, those old quilting books!) Once I get an idea, I'll sketch it on graph paper, work on the measurements (I LOVE quilt math!) and then do a test block. After I have a block done, I'll bring it into Photoshop and play around with settings. I'll work on things until I'm happy with a look, then I'll go make the quilt. Because I do all the math ahead of time, the actual patterns come together pretty easily. 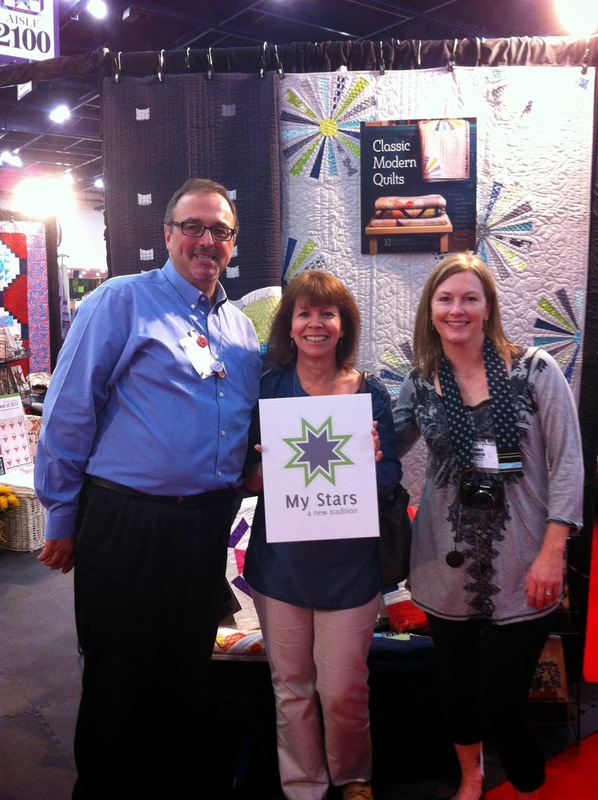 The bloggers I've nominated are my friend Tammie Schaffer of Crafty Tammie Tammie and I have been on line friends for years, and finally met at quilt market last fall. We each have a project in the book Classic Modern Quilts. I'm also nominating my friend John Kubiniec (see above!) of Big Rig Quilting. He's also in Classic Modern Quilts. Thanks for stopping by. Feel free to follow me in your favorite social media way! Links all on the sidebar! Thanks to Cheryl for nominating me! It was fun!